Firefox version 7.0 final/stable has released! …and available for download (of course, for all commonly used operating systems such as Mac OS X, Windows 7or Linux based OS – Ubuntu, OpenSuse, Fedora etc, ). Mozilla Firefox is one of the most popular web browser. it’s open source and available free of cost, for all. What’s new in Firefox 7.0 ? GNU/Linux (such as Ubuntu 11.04/10.10/10.04.. Debian, Linux Mint etc) users can download tar.bz2 file . other users can download it from the official website. That’s all … Have Fun! Mozilla Firefox version 7.0 a2 is available for testing and fun! 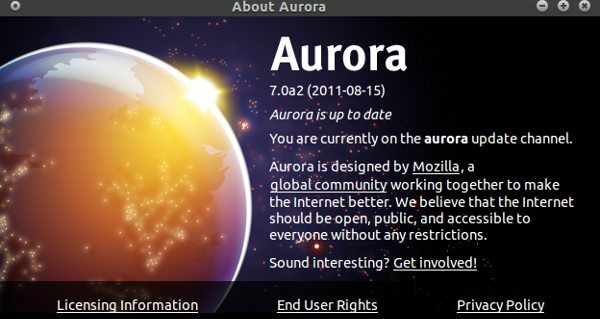 (through Aurora Channel), for all common operating system such as Windows, GNU/Linux and Mac OS X; final version (Gecko 7.0) will be released on Oct 2011. 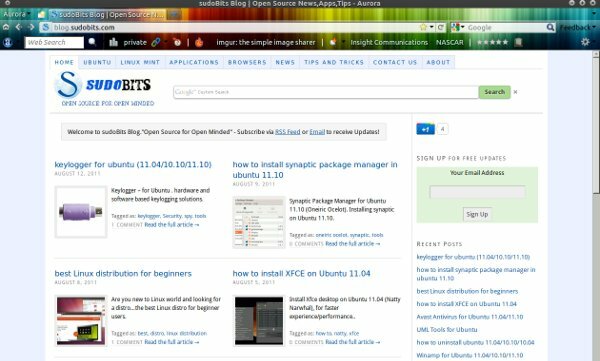 If you are looking for an stable version of Firefox i.e 5.0 for Ubuntu 11.04 (Natty Narwhal) or (Maverick Meerkat) or 10.04 LTS , then its OK for production environment but if you want to do some experiment and can’t stop yourself from trying something new, exciting and cutting edge features, then give it a try. Probably your already know that – Firefox has been releasing its new version very rapidly which has both positive as well as some negative effect on its usage share. Anyway, the current share of Firefox is around 37% in the browser market. Firefox has huge number of plugins available free to use, which makes firefox the most popular among web developers. Firefox 7 has planned for lot of new features such as in Canvas element, CSS3 animation effects (e.g text overflow is supported, -moz-orient problem is fixed), WebGL related feature such as cross domain texture support, removal/addition of elements in HTML as well as DOM (Document Object Model), Navigation Timing etc. Warning! : Since it’s an alpha version, it may crash your existing firefox installation or you may experience other difficulties. It is supposed to be an experiment (Testing), the statistics/report generated by you may will help developers(specifically in bug fixing), so consider sharing your experience through comments. step 3 : Now, close all your existing firefox windows and move on to the extracted folder and execute firefox. step 4 : That’s All.. The Firefox vs 7.0 a2 will start within a minute, after checking the compatibility with plugins etc.